During the course of the 2008 CODATA conference, two special sessions were held to reduce the burden spent on reporting directly to the General Assembly, and to allow greater involvement of conference members. The first special session was on "Collaboration with ICSU Organizations and Report from the ICSU ad hoc Strategic Committee on Data and Information (SCID)". Its main purpose was to discuss the recommendations contained in the report of the ICSU ad hoc Strategic Committee on Data and Information. This Committee, following on from the ICSU Priority Area Assessment Report of 2004, was formed to implement the key recommendations from that report relating to the reforms of ICSU's own structures. It acknowledged CODATA's development of a Strategic Plan, recommended that CODATA be closely involved with a new ad hoc ICSU Strategic Coordinating Committee, and recommended that CODATA should work closely with the the World Data System (a proposed reorganisation of the World Data Centres and Federation of Astronomical and Geophysical Data Analysis Services). There was some discussion on the lack of a forum to discuss common areas of concern across disciplines and related organisations: the forum SciDIF suggested by the PAA was not recommended in the SCID Report. An account was given of a joint technical project between ICSTI and CODATA on data citation, to which the IUCr would be interested in contributing. The second special session allowed National and Union members of CODATA to report on their relevant activities in the previous two-year period. The highlights of IUCr activities were presented (Powerpoint presentation | annotated PDF). The General Assembly noted the SCID Report and expressed some concern that CODATA's role was seen as an adviser to the World Data System component of the ICSU reorganisation, and not an active driver. There was some comment that this reflected the fact that CODATA was still developing focus within its evolving Strategic Plan, and might at a later stage become more closely involved. The General Assembly reviewed progress with the CODATA Strategic Plan, and noted the urgent need to finalise the Plan and roll out energetic work plans within each of its three major initiatives (the Global Information Commons for Science Initiative, the Scientific Data Across the Digital Divide Program, and the Advanced Data Methods and Information Technologies for Research and Education (ADMIRE) project). 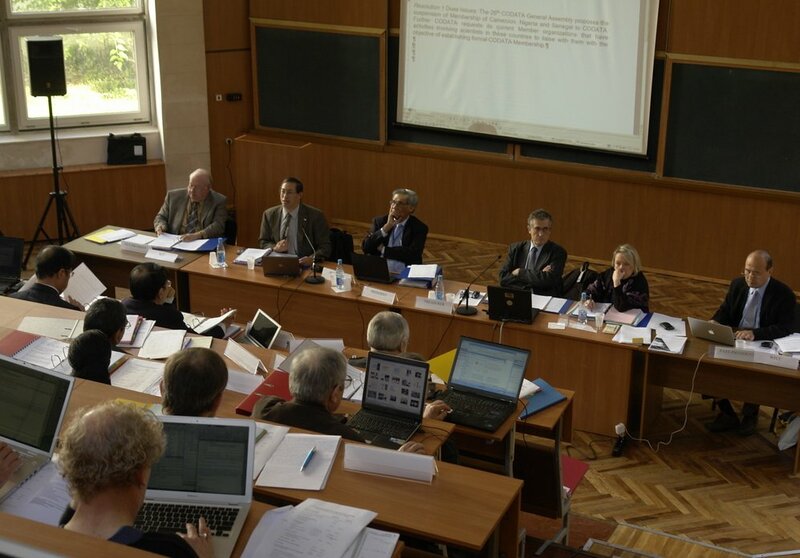 Reports were presented on the activities of a Dues Committee, which recommended the adoption of a Euro-based dues structure to improve the financial stability of the organisation; and of the Finance/Investment Committee, which was restructuring bank accounts and investments to improve the security of CODATA's financial arrangements. The report of the activitities of the Secretariat described the major upheaval during the period involved in relocating the office to its new premises at 5 rue Auguste Vacquerie in Paris, but also described the many projects in which it had been actively involved in spite of the disruption. The General Assembly greeted this report with acclamation. Australia and the UK were formally welcomed as new National Members of CODATA. Italy has withdrawn its membership. In recognition of strenuous efforts to raise the necessary dues, the General Assembly voted that France should become a Full Member with reduced dues pending further efforts to raise enough revenue to satisfy the payment of full National Member dues. The memberships of Cameroon, Senegal and Nigeria lapsed, but the General Assembly resolved to follow initiatives to engage developing countries more effectively in future membership growth initiatives.